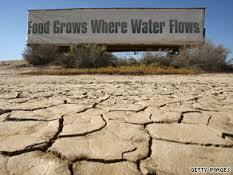 Our Food Supply may be Rapidly Reduced with Rises in Temperatures. August 22, 2014—Change through time is a basic attribute of Earth. Earth has been undergoing constant change since it was formed from a cloud of cosmic dust some 4.6 billion years ago. The changes that have taken place and are taking place vary in form, size, duration and areal extent. Days use to be shorter than now; the planet has been both warmer and colder than it is now and the magnetic poles of Earth have changed end for end. Mountain ranges have grown and then eroded away. Ancient seas no longer exist; and biological species have appeared and disappeared. Even the sun which supports life on the planet is not a constant source of energy. Earth’s climate has changed through time like all else. Throughout most of the history of Earth, the planet was much warmer than it is now. The initial atmosphere contained high concentrations of carbon dioxide and little oxygen. Eventually, the balance between carbon dioxide and oxygen changed to what we have now with much more oxygen. Scattered through time were ages of extreme cold. The earliest ice age took place two billion years ago. The second glaciation took place between 800 and 600 million years ago. This may have been the most extensive glaciation ever to occur on the planet. The global environment is changing now faster than at any time in recent history. What is most significant perhaps is that not only is it changing at a rapid rate but the rate at which it is changing is itself increasing. Simply put the environment in which all living things exist is changing faster and faster. A few examples of current phenomenon will serve to make the point. Modern humans or Homo Sapien Sapien evolved in Africa some 200,000 years ago. From Africa the species spread out over the planet. It took the modern human species more than a hundred thousand years to reach a total population of one quarter million. We are now adding a quarter million people to the planet each and every day. Each of these added individuals needs food, clothing, and shelter in order to survive. In addition to meeting the needs for survival, they will want many of the amenities of life that are found in the most prosperous countries. Much of the rapid change taking place now is tied to the phenomenal growth of the human population. One of these rapid changes taking place now is the elimination of animal and plant species. There have been times in the past when a large number of species became extinct due to some natural catastrophe. These times are referred to as mass extinctions. Species of plants and animals are now becoming extinct at an extremely high rate. The rate of extinction of species before human development is estimated to have been about one species every ten years. The current rate is at least 100 each year and possibly as high as 1000 each year. Elephants are one species of animal whose numbers are declining rapidly. One hundred thousand elephants were killed in the two years from 2010 to 2012. Satao, the largest known African Elephant was killed by poachers in Kenya near the end of May 2014. 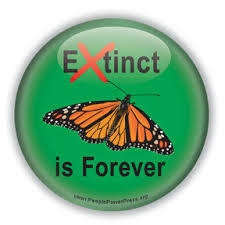 The Monarch Butterfly has Rapidly Reduced in Numbers. Another example of how fast species are declining is that of the monarch butterfly. Less than two decades ago as many as a billion monarchs migrated to Mexico for the winter. In the fall of 2013, that number dropped to a tiny fraction (1/30) of previous decades. The primary reason for the drop in numbers is the tremendous application of herbicides to agricultural fields. This rapid drop in butterflies is just one of what is now considered to be the sixth mass extinction. Earth’s climate is being altered by the human species. The planet is warming up due to human activity. The highest average atmospheric temperatures ever recorded for the months of May and June occurred in 2014. The heating is having a profound impact on almost all parts of the environment including the world ocean. What the outcome of these rapid changes for the human population and other living species is not known. An even cursory look at what is happening on the planet in 2014 suggests that some drastic changes in the behavior of the human population need to take place now. The only question is whether the people understand and will demand the changes. Categories: Climate Change, Disappearing Ice Shelves, Fossil Fuels | Tags: Arctic Ocean, Climate change, Co2 and Global Warming, Fossil fuel, Greenhouse gas, Population growth | Permalink.